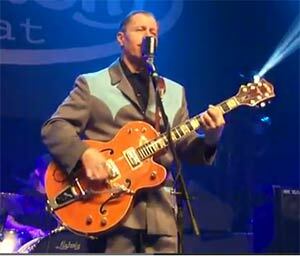 The non-stop touring machine known as Reverend Horton Heat celebrated their 25th Anniversary, which occurred sometime last year. As many bands are doing nowadays, they decided to mark the occasion with a special tour. The setlist this time started in chronological order, leading up to their most recent album. After a brief intermission, the Reverend came back out and took requests for whatever songs were called out from the audience (though I have reason to believe the choices were from a small pre-determined pool due to the similarity between recent setlists). Once again, the Reverend broke out some tunes I haven’t heard live yet and mixed it up with the classics, closing out the show as usual by playing “Big Red Rocket of Love” broken up with “Folsom Prison Blues” in the middle, just to keep it real (country). Included in this post are “Bales of Cocaine” and “Loaded Gun” from 1993’s Full Custom Gospel Sounds and “Psychobilly Freakout”, the video for which was on Beavis and Butthead back in the day.